This article is about the guest star. For the character, see Alison Bechdel (character). 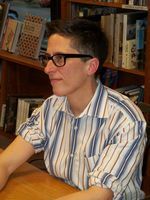 Alison Bechdel (born September 10, 1960) is an American cartoonist. She guest starred as herself in the Season 29 episode "Springfield Splendor". Modified on October 9, 2017, at 12:31.